There are four vesicular diseases of pigs which are difficult or impossible to differentiate clinically: FMD, swine vesicular disease (SVD), vesicular exanthema (VES), and vesicular stomatitis (VS). Of these, FMD is the most widespread and important with SVD being of secondary importance in some regions. Foot-and-mouth disease (FMD) is a highly contagious viral disease of many wild and domestic cloven-footed mammals and many other animals. In swine, the disease is characterized by vesicles on the feet, snout and in the mouth. The other two have very limited distribution and VES has disappeared. FMD is so important because it is highly infectious, spreads rapidly throughout animal populations and over long distances on the wind and hence it is difficult and costly to control. It can also be carried from animal to animal on the clothing, infected equipment or vehicles. Foot and mouth disease is caused by the virus Picornavirus (Aphthovirus). The incubation period is normally one to five days but could potentially be up to 21 days. There is no certain age of pig that can be affected, all pigs can potentially contract this disease. The skin around the snout, or lips, inside of the mouth, around the coronary band and the softer skin on the feet becomes whiter (blanched). Vesicles often occur at pressure points on the limbs, especially among the carpus (knuckling) After exposure, vesicles (blisters) erupt. They tend to rupture after 24 hours and if there is no complications or secondary infection, pigs typically heal rapidly within 2 weeks. This is the most contagious animal disease, the mortality rate in older pigs is low, but often high in pigs that are young. Cattle is usually the main host although some strains have now appear to be specifically adapted to domestic pigs or sheep or goats. FMD is endemic in parts of Asia, Africa, the Middle East and South America (sporadic outbreaks in free areas). In pigs early signs are lameness a drop in food consumption and some pigs appear depressed and have fevers of about 40.5ºC,(105ºF). In piglets sudden death due to cardiac failure is common. What should make you strongly suspicious is the appearance a little later of vesicles up to 30mm. diameter, similar to those described above for cattle. They are most plentiful around the coronets but are less plentiful on the nose and lips although this is where you are likely to see them first. They often appear on the teats of recently farrowed sows. By then the sows and some of the other pigs may be dribbling saliva and chomping their jaws. If they are on bedding they may not appear lame but if they are on concrete they probably will be. If you farm near the coast of California where FMD and SVD are extremely unlikely, vesicular exanthema could be a possibility. If you farm in Georgia, the Carolinas or Central or South America and it is summer/autumn time perhaps you should think of vesicular stomatitis. The clinical signs of all four diseases are almost indistinguishable. Within 24 hours many of the vesicles will have burst. On the lips and teats they may leave shallow erosions but on the coronets of the feet secondary infection and trauma may convert them into raw jagged-edged ulcers. If the pigs are not killed some may lose their complete hooves (so-called "Thimbling"), sows may abort, as a result of fever, and in severe outbreaks some may die. With the feet, the hoof may become detached revealing the raw painful tissues underneath. 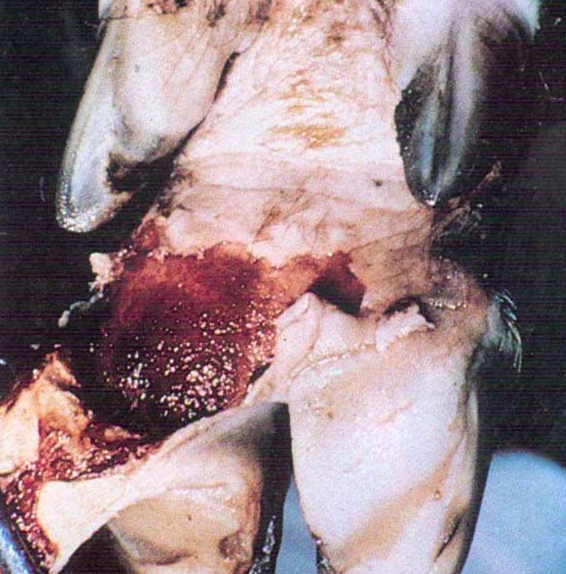 The hoof can re-gorw, but it is usually deformed and this process takes several weeksBoars may go lame and stop serving sows, so there is an infertility side effect. There may also be an increase in mortality among suckled piglets. This is often the first sign. In endemic areas where vaccination is carried out routinely the disease is not a serious economic problem in pig herds. ~You should ensure you maintain the highest standards of hygiene for all movements on and off your farm. ~Have only one combined entrance and exit. Display the name of the farm and the telephone number on the gate. Keep the gate locked. ~Provide a means of contact between farm entrance and house for essential callers, e.g. a bell or a gong. Supply a tub of disinfectant, a brush for scrubbing footwear and a spray pump. Keep the disinfectant solution clean and renew it daily. ~All vehicles entering and leaving the premises should have their wheels sprayed with approved disinfectant. ~Stop all non-essential vehicles and visitors from entering the farm and arrange whenever possible for collection and delivery of supplies to take place at farm boundary. ~Keep a record of all deliveries. In the event of disease being confirmed this may help in epidemiological investigations. ~Where possible, house all the animals or keep them away from the perimeter of your farm. ~Ensure you complete all records of stock movements as required by existing legislation. ~Each farm must be treated as a separate unit. Make separate arrangements for labour, management and feeding. ~Keep dogs, cats and poultry under control. ~Make every effort to destroy rats and other vermin. They may spread the disease. ~Keep your stock away from household waste, bones or swill. ~Limit contact with other peoples livestock and with other keepers of livestock. ~Should you have any contact with them, before you go near your own animals, disinfect your footwear, change your clothes and wash with hot water and soap, including your hair. Any item or object that may have had contact with disease must also be disinfected. ~Healthcare officials are aware of precautions necessary and you must not delay seeking medical assistance if needed. Prevent this disease by using sanitary prophylaxis or the highest standards of hygiene, protecting free zones by controlling animal movement and surveillance, quarantine affected animals away from other unexposed animals and cleaning and disinfecting all infected material including cars and clothing and areas the affected animals were in. If a + diagnosis is made, the USDA will be called and alerted and possibly visit the affected areas for additional testing, the only treatment for this disease is to destroy the affected animals. news article dated 2014 regarding an outbreak go FMD in Korea.